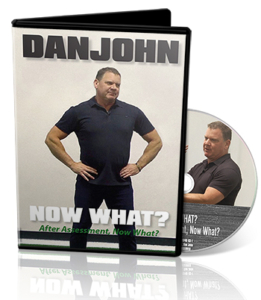 Training wisdom from Dan John: strength coaching athletes isn’t always about the weight room. Sometimes you have to get inside their heads. Once we move that athlete up 10 years later, we grow them out. Ten years later, we might do what we call arousal training. Arousal training involves my athlete sitting a chair and me yelling at him and saying terrible things about his family, his girlfriend, and all of his friends. I’m trying to break him mentally. We might have a 45-minute workout—a throwing workout—where he doesn’t get out of the chair. I tell him to stand up, sit down, stand up, sit down. I’m trying to get inside his head, so when he gets in the discus ring, we can work with him. When you’ve got a 22-year-old discus thrower, you might do high volume, high load Olympic lifts. That’s not appropriate for a 12-year-old. You might want to do advanced recovery techniques, cryotherapy, or massage might make a difference. You’ve got a guy who’s benching 400 and throwing the discus 10,000 times in a year, you might want to spend some time working on the shoulder. After they throw, you give them beer and cheese pizza and pancakes. You don’t want that kid throwing then. Like what you’ve seen from Now What? . . . and wondering, now what?